There are several ingredients in the proof of this result. These will provide examples of the techniques that I have discussed in past posts. So take . Draw the geodesics between the respective pairs of points, and let be the inverse images in under . Note that are straight lines, but is not in general. Let be the points in corresponding to respectively. Let be the angle between ; it is equivalently the angle at the origin between the lines , which is measured through the inner product structure. Now from the figure and since geodesics travel at unit speed, and similarly for . 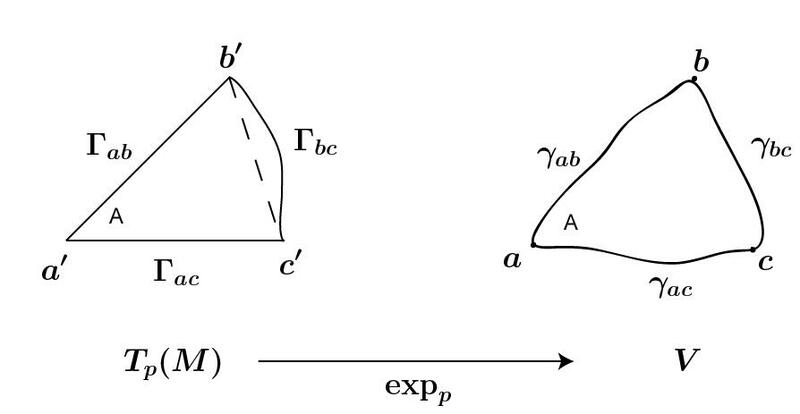 Moreover, we have , where the first inequality comes from the fact that has negative curvature and then increases the lengths of curves; this was established in the proof of the Cartan-Hadamard theorem. So we have a cosine inequality.